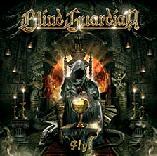 The upcoming, four-years-in-the-waiting studio album by Blind Guardian is abso-F’n-lutely among the most, if not THE most anticipated album of the year on my behalf. The first single Fly is served as a succulent appetizer to us impatient goblins to devour with much greed and delight, for at least to me, this new magic tastes damn good. Skalds and Shadows (Skald = put simply, a Nordic bard in the Viking ages) is a much more typical Blind Guardian lighterraiser. This fully acoustic version carries on the bands reputation for awesome ballads with pride and it has all the makings of becoming a favourite live shout-along like The Bards Song (In The Forest), from the catchy rhythmics to the very infectious chorus. The beautiful flute melodies add a lot to the already prevalent medieval musings, that (once again with BG) create the clear image of a circle of bards playing this in the middle of a lively marketplace somewhere in continental Europe in the 16th century. The full record is supposed to contain a more orchestrated version of this tune, which to me sounds brilliant. The crop is rounded up with Guardians take on the Iron Butterfly classic In A Gadda Da Vida. The original is given a steroid shot in the proverbial arm and raised up to the tempos of BG rockers like Somewhere Far Beyond or Bright Eyes. A very grooving version that could fit very well into the bands live set (but hopefully won’t, because there is too much awesome stuff to pick from in BG’s discography alone). The production is stellar all around and the playing is tight on all sides. This single raises my expectations for the coming record even higher if possible. It offers both the rocking and progressive side of Blind Guardian in a tasty mix, which left this piehole watering like that of a starving pothead after a 6-day reeferbinge. From the looks of this sample, a possible album of the year is headed this way.